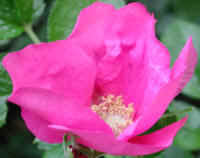 (Wild Rose, Rosa Rugosa - 01) The Rosa rugosa is a native of China and Japan which found its way to the United States and now grows wild at Sleepy Hollow Lake. 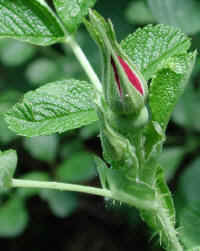 Note the extremely thorny stem below the bud. 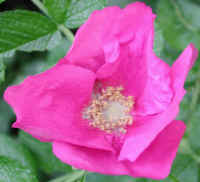 (Wild Rose, Rosa Rugosa - 02) Although the Rosa rugosais often grown as a domesticated rose, the irregular shape separates it from the domesticated varieties. Its perfume, however, doesn't takes second place to any variety. This spring, with only two flowers in bloom, the beautiful aroma of the perfume of this wild rose was quite evident in our front yard. It beckons us to "take the time to smell the roses". 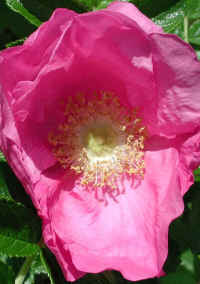 (Wild Rose, Rosa Rugosa - 03) The fully opened Rosa rugosa flower measures nearly four inches across, and it presents itself as a testimony of the Lord God who created it. (Wild Rose, Rosa Rugosa - 04) The light and shadow gives and interesting contrast to the newly opening Rosa Rugosa. 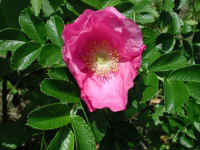 (Wild Rose, Rosa Rugosa - 05) The Rosa rugosa develops new plants from the roots and forms dense thickets that grow to 3-5 feet (1–1.50 meters) tall. (Wild Rose, Rosa Rugosa - 05a) The leaves of the wild rugosa rose are pinnate, meaning that each leaf has several leaflets growing opposite one another and has one terminal leaflet. The length of the leaves can be from a little over 3 inches long to up to 6 inches long (8–15 cm) with 5–9 ovate leaflets, most often 7. Each leaflet is about 1-1/2 inches (3–4 cm) long. 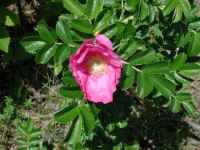 The leaf in this photo has 7 leaflets, the inner two of which are partly hidden under the flower. 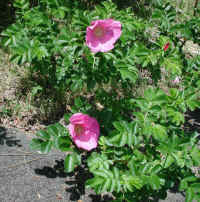 The rugosa rose leaflets have a toothed margin or edge with a distinctly corrugated (rugose, hence the species' name) surface. (Wild Rose, Rosa Rugosa - 05b) This is another look at a wild rugosa rose flower. The upper portion of the rose in this photo is still cupped in the typical rose shape. When in this stage of development the flowers measure about 2 inches across; however when the petals fully open, as the bottom petals have, the flower can measure as much as 4 inches across. 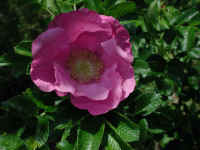 We can also see that this rugosa rose has double petals (2 petals thick), but they can also have a single layer of petals. 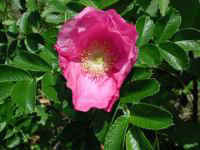 (Wild Rose, Rosa Rugosa - 06) This is another look at the wild rugosa rose. The rose is one of the flowers that remind us of the way God deals with sinful human beings. After Adam had disobeyed God (Genesis 3), God told Adam that his disobedience had cursed the ground and that thorns and thistles would grow where he had to till the ground to grow food (verses 17 and 18). Nothing could be thornier than the rugosa rose, but in the midst of all the thorns, God places these beautiful flowers to remind us of his forgiving grace, if we are willing to accept it, and to also remind us that as peacemaking children of God (Matthew 5:9), we can free creation from this curse of corruption (Romans 8:18-23), if we are willing to do so. (Wild Rose, Rosa Rugosa - 06a) In this bee's eye view of the wild rugosa rose flower, we can see the sunlight highlighting the many stamens. 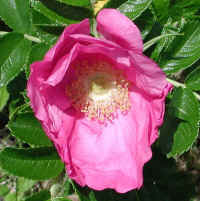 (Wild Rose, Rosa Rugosa - 07) In this photo of the wild rugosa rose, we can see both a flower with a single layer of overlapping petals, and a flower with double petals. (Wild Rose, Rosa Rugosa - 07a) This is a little closer look at both types of wild rugosa rose flowers. 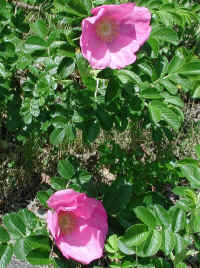 (Wild Rose, Rosa Rugosa - 08) In this photo of the wild rugosa rose, we can see the single layer of petals on the flower on the lower left, and double rows of petals on the other two flowers. (Wild Rose, Rosa Rugosa - 08a) It is much easier to see the 5 individual 4.5cm broad by 4cm long overlapping petals when there is only one layer of petals. Each flower can also have 100 or more stamens arranged in a fan around the central pistils. 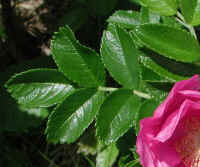 In our area, the wild rugosa rose begins to bloom around the 1st of June and sometimes will continue to bloom until October. (Wild Rose, Rosa Rugosa - 09) The filtered sunlight coming through the leaves of the tree above, gives this wild rugosa rose an interesting perspective. 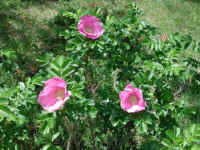 Rosa rugosa can also have white flowers, but they don't grow on the same bush. (Wild Rose, Rosa Rugosa - 09a) The way the sunlight is hitting these wild rugosa rose leaves, it highlights the corrugated appearance. 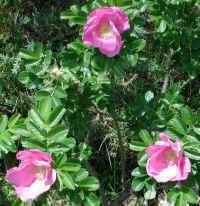 (Wild Rose, Rosa Rugosa - 10) This is another look at some of the wild rugosa roses. (Wild Rose, Rosa Rugosa - 10a) In the lower left of this photo, we can see a wild rugosa rose leaf with nine leaflets.